I am regularly asked about upgrades to the Technics SL-1200 MK2/3/4/5/6 series of turntables; what’s worth doing, what’s not, how much it costs etc. I’ve written this guide to explain the considerations and possible benefits to be had by upgrading and modifying the SL-1200. Its not intended as a buyer’s guide and I’m not going to review individual products, its more to explain what you should consider when choosing from the wide array of ‘audiophile’ bolt-on sound quality improving products currently available for the SL series from various boutique manufacturers. Firstly - Is there anything wrong with the Technics SL and does it actually need upgrading? The short answer is ‘No’. It is already a highly competent record player which has many design features which are only available on eye-wateringly expensive new ‘audiophile’ decks. The cost to develop a turntable of a similar build quality from scratch would be multiple million dollars these days. As can be seen from the numerous SL imitators on the market, its possible to make something that looks like it but it just doesn’t feel the same. This is entirely down to the build quality. Having said that, the SL-1200 was designed and built to meet a certain retail price point, hence there is room for improvement. The SL-1200 series of turntables was not designed for DJ use. Its suitability for DJíng is a by-product of it being a great record player, not the other way round. How do I know what Panasonic were thinking when they came up with the design brief? I don’t. But I do know that when this turntable was designed in the late seventies no-one wanted to be a DJ,; It wasn’t a cool thing to be. DJ’s then didn’t earn very much money, it was a job reserved for social misfits with obsessive collecting habits who had difficulty meeting girls. Does this sound like a demographic that a Japanese electronics giant such as Panasonic would identify as a target market for a multimillion dollar new product development? No,of course not. It was only from the late 80’s and early 90’s, due to the explosion of rave / acid house / dance culture, that being a DJ became a desirable job with an established career path and the possibility of earning big money and relative fame. The SL-1200 MK2 was already ten years old at the point when Panasonic sales reps first noticed an unusual spike in it’s sales graph. The second surge in its popularity came around the same time that Panasonic ceased production. The ‘audiophile’ crowd had previously always dismissed the SL-1200 as a ‘DJ deck’ but sometime in the late 2000’s word began to spread through hi-fi forums that this the SL-1200 in stock form was actually a pretty decent hi-fi deck and, with a few modifications, was capable of outperforming new high end turntables at a fraction of the cost. It was this acceptance and the results of ‘open source’ online design projects which lead to today’s market for aftermarket upgrades and modifications for the SL-1200. On its launch, the SL-1200MK2 was pitched at the upper mid-range hi-fi market but was not by any means Panasonic’s best work. That title was reserved for the SP10MK2 which became the de facto broadcast standard because it was an all-round superior record player. The difference between the two products actually forms a guideline for SL upgrades. The SP10MK2 came with an external power supply, much more complex speed and voltage regulation circuits and without a tonearm as it was assumed that buyers would have their own preference. Contained within the groove of a vinyl record is an almost perfect copy of the music as the producer intended it to sound. The only thing that stands in the way of you hearing the music that way is what you play it back on. The Neumann VMS80 lathe, on which pretty much all vinyl records have been cut since the 70’s was (and still is) a miracle of micro-mechanical engineering, capable of carving the tiniest harmonic detail into the revolving lacquer master. Retrieving the fine detail from a vinyl record, which is the part that can make music sound holographic and three dimensional, is entirely a mechanical challenge. This is why some record players are considered ‘better’ than others. The unfortunate reality is that the more precisely engineered it is, the more expensive it gets. In the world of high fidelity sound there is a widely accepted truth known as ‘The Law of Diminishing Returns’. In relation to sound reproduction equipment this means that there is a point beyond which one has to spend a large sum of money to gain very little in terms of improved sound quality. The Technics SL-1200 series of turntables is already near the threshold where, in order to gain any noticeable improvement, you have to spend a considerable amount more cash than you spent on the turntable itself. Precision engineering and small scale electronics manufacturing is undeniably expensive but some manufacturers use smoke, mirrors and fairy dust in an attempt to justify ludicrous prices for products which perform no better than another which is half the price. My advice is set yourself a budget and work within it. Bear in mind that a fully upgraded SL-1200 will perform as well as new turntables which cost 2 or 3 times what you might spend on a fully tricked out MK2, so you’re actually getting good value for what you spend in terms of sound quality. Another popular expression in high fidelity sound-speak is ‘the difference is like night and day’. Individually, none of these upgrades make a difference so marked as the difference between night and day, black or white, chalk and cheese or anything so extreme. They do however each make a small improvement and, where you to do all of them at once, you would then hear a significant ‘wow’ difference. A sound system is only as good as its weakest link or its poorest quality component. There is absolutely no point in spending money on turntable upgrades unless your amplifier and speakers are capable of reproducing these subtle improvements. What upgrades can I make? There are seven main areas which can be improved, assuming that we are starting off with a turntable which is ‘working perfectly’ according to the original design. ‘Working perfectly’ in this case means that the main bearing is in good condition and well lubricated, the tonearm bearings are in good condition with no free play or jerky movement, the pitch and Quartz master clock frequency are adjusted to factory spec, the speed control electronics on the main circuit board are working correctly, the platter is not warped or bent and that you have carefully followed the instructions to set up your turntable and cartridge correctly. Ok, so this is not an upgrade to the turntable as such but for most systems I see on my travels this is the weakest link. If you plug your turntable(s) into the phono inputs of a DJ mixer or a domestic hi-fi amplifier then you can make a significant sound quality improvement by choosing a dedicated external phono preamplifier instead. I would say this should be your first point of call before considering turntable modifications unless you are using a rotary style DJ mixer, which generally have better quality phono preamps built in. However, a high quality dedicated hifi phono preamp will still knock spots off the phono preamps included in most rotary mixers. The phono preamp has two jobs. Firstly, it reverses the RIAA equalisation which is applied during the record cutting process. This is a paradigm-busting revelation to most people who are new to vinyl records. If you have ever accidentally plugged a turntable into a ‘Line’ ‘CD’ ‘Aux’ input you will know that what you hear is lacking bass and the mid and high frequencies sound very harsh. I’m sorry if I’m the one to break it to you but this is actually a true representation of how the music on the record sounds. At the point that the soundwave is being carved into the vinyl lacquer at the mastering room, a fixed EQ curve is applied which cuts much of the bass and boosts the mid and higher frequencies. By cutting the bass it allows more physical space on the record surface so that playing time on each side can be increased. The mid and high frequencies are boosted in order to hide the noise made by the cutting head itself which would end up being cut into the record otherwise. The accuracy with which the phono preamp stage reverses this fixed EQ is critical to sound quality. After reversing the RIAA equalisation, the preamp circuit amplifies the tiny fluctuating voltage created by the movement of the stylus and magnet assembly in the cartridge. Because the voltages are so small (a few thousandths of a volt) great care needs to be taken in the design and components used in the amplification stage to preserve the integrity of the waveform and avoid inducing hum, distortion and other unwanted artefacts. The phono preamp stage has a huge influence on the quality of sound reproduction. Check out as many as possible and buy the best one you can afford. Again, this is not a modification to the turntable as such but great gains can be had by switching from a cartridge and stylus intended for DJ use to one which is deemed ‘hi-fi’. The main reasons for this are the shape of the diamond stylus tip and the strength and rigidity of the cantilever and suspension assembly. Most DJ cartridges have conical diamond tips. The advantages of the cone shaped diamond are that they tend to cause less record wear from backcueing and also that they are less fussy about alignment because their contact area with the record is smaller. Damaged and worn out records also sound better when played with a conical stylus because it doesn’t have so much contact with the groove walls where the damage actually is. The disadvantage is that, because of their shape, they are not able to follow the smaller modulations in the groove, which is where the fine detail of music is to be found on a vinyl record. This fine detail can make the difference between music sounding flat and two dimensional or three dimensional with depth, width and height. 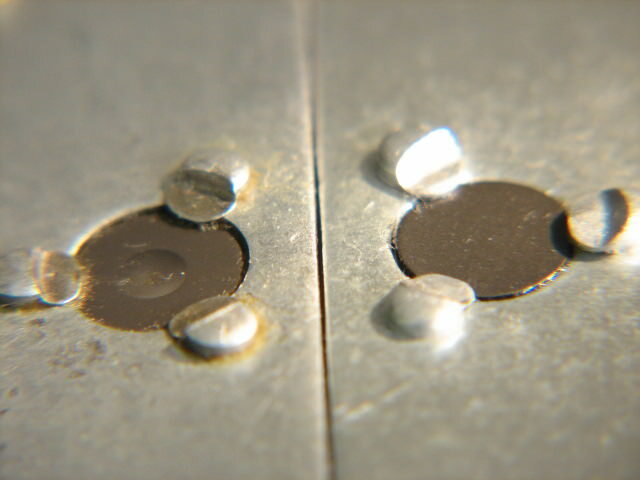 A cartridge and stylus considered ‘hi-fi’ would generally have an elliptical shaped diamond or one of several variations on this theme. An elliptical shaped diamond is much more able to follow the fine detail in the groove and is closer to the shape of the diamond cutting stylus on the lathe which made the groove in the first place. The downside of elliptical stylus is that it will also do a good job of playing groove wear and damage which may result in a distracting level of background noise when listening to beaten up and played to death old records. The other sound quality compromise made for DJ cartridges is in the strength and rigidity of the cantilever and suspension assembly. The cantilever is the tiny metal rod that exits the cartridge body which has the diamond stylus tip bonded to one end and the magnet which interacts with the cartridge coils on the other. In order to be able to backcue a record without it jumping out of the groove you need at least 3 grams of downward tracking force on the stylus. In order to have 3 grams of tracking force on the stylus tip you require a cantilever which is able to support that kind of downforce without bending or flexing but is still able to move freely from side to side. Also the suspension which holds the cantilever in place and allows it to vibrate freely when following the groove needs to be robust enough to allow you to clumsily stop the record with your hand, wind it backwards and forwards etc whilst still following the groove. Most DJ cartridges have conical shaped stylus tip and manufacturer recommended tracking force of between 3g and 5g. Most hi-fi cartridges have an elliptical stylus tip (or some variation of that shape) and track at 1.5g to 1.8g. DJ cartridges have thicker and more rigid cantilevers and stiffer suspension to be able to handle higher tracking weight and backcueing. Hi-fi cartridges are all round more sensitive and delicate, have to endure less extreme physical forces and are more able to replay fine detail and subtle nuances. So, having put your vinyl playback system into the best state in can be in stock form you can then start to look at modifications. The function of the tonearm is to suspend the cartridge and stylus assembly over the record while applying a precise downforce on to the stylus tip and an equally precise lateral force to counteract the skating effect caused by the stylus travelling in the inwardly spiralling groove. It would ideally offer zero resistance at the pivot point where the arm tube meets the base, which is usually achieved by some kind of bearing assembly. It is also required to be extremely rigid but also relatively lightweight and through its construction and materials should not pass vibrations and resonances picked up from the cartridge, the motor or the playback coming from the speakers. It’s a tough job. There is nothing really wrong with the standard SL-1200 tonearm but there are better ones. The stock arm can be improved to a surprising degree by an internal rewire. This is only worth doing if your existing tonearm bearings are in perfect condition; try this test to establish how well your tonearm is working. Rewiring tonearms is not for the feint-hearted. It has a steep learning curve which can be very frustrating and result in expensive mistakes. I’d recommend having a professional do this for you if you want to go down this route. If you find that your tonearm bearings are worn or damaged and therefore it needs replacing you should consider the total cost of the replacement arm wand assembly together with the rewire against the cost of an arm which is actually better in standard form. There are a number of non-Technics tonearms which are commonly fitted to the SL-1200 as an upgrade. This is made possible by using an adaptor plate which bolts into the plinth where the previous arm assembly fitted and mounts the arm it was designed for at the correct distance from the centre spindle. Buying preowned tonearms comes with a degree of risk. A standard tonearm in good condition will sound better than a fancy one in poor condition. There is an abundance of preowned Rega tonearms in the market and brand new ones are not prohibitively expensive. A bit further up the price range the Jelco SA750D is very much deserving of the higher price tag and if you have really deep pockets then the SME range is really the ultimate in precision engineered tonearms. Another popular upgrade For the SL-1200 is an external power supply. Although it might appear to be a pretty dull subject, the quality and design of a power supply is of critical importance to sound quality in all audio equipment. You can find a clear and simple explanation of power supply considerations here. Upgrading the Technics power supply has two main advantages. The stock power transformer, although well shielded, emits a field of electro-magnetic interference which is picked up by the cartridge which results in a low level hum. By removing the transformer from the body of the turntable and placing it far away from the sensitive cartridge it lowers the noise floor and therefore the dynamic range available for music is increased. Secondly, aftermarket power supplies will generally have additional circuitry which smooths and regulates the power which the turntable receives which results in a slight improvement in speed consistency and thereby sound quality. Normally the stock internal voltage regulator is also replaced for a more precise modern equivalent when installing an external PSU. The stability of the voltage and ready availability of current affect the performance of the motor and quartz speed control circuits which has a knock on effect in sound quality. However, no matter how perfectly regulated the voltage coming in might be, the turntable still has its own internal sources of ‘noise’or tiny voltage fluctuations from the strobe light circuit, the pitch circuit and the pop up lamp. Some people have gone so far as to separate the main circuit board into three sections with a separate voltage regulator for each. The Law of Diminishing Returns will definitely come into play with this degree of modification. The bearing is the support mechanism for the centre spindle and platter assembly. Low frequency rumble is created at the point where the base of the revolving spindle meets the thrust pad. Over time the plastic thrust pad wears causing an indent which in turn creates a greater contact area between the spindle and the pad thereby causing more rumble. There are a number of very well engineered but eye-wateringly expensive replacements bearing assemblies on the market as well as cheaper solutions such as replacement thrust pads. There is also anecdotal evidence that molten wax or a wedge of neoprene between the bearing bottom and the plinth can help to reduce bearing rumble by providing another route for vibrations to pass and be absorbed. 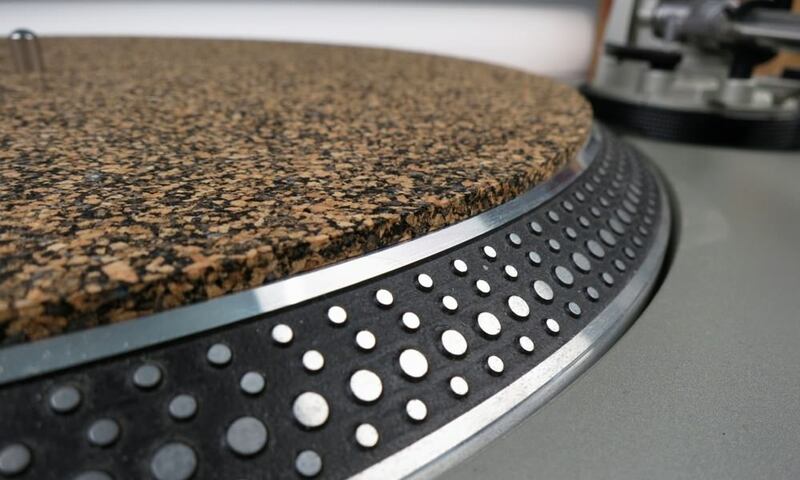 The job of the isolation feet is to prevent the vibration from the music playing in the room being passed back through the surface of whatever the turntable is sitting on to the plinth, platter, stylus etc which has the effect of colouring the sound. The stock vibration isolation feet are not great at their job. If you play music at reasonably high volume or you are forced by space confines to have your turntable near to your speakers or on a less than ideal surface you will definitely hear the benefit of better isolation feet. There are a number of nicely designed and very effective isolation feet on the market. I find Sorbothane hemispheres to be just as effective as any of them and are by far the cheapest upgrade option on this list. The platter mat also performs an important job with regards sound quality. It should as much as possible prevent vibrations from the motor, bearings, tonearm, airborne music and vibration induced into the record by the stylus itself from passing through the surface of the record and back to the stylus, causing a blurring of the signal. It must also grip both the record and the platter equally well in order to counteract the ‘needle drag’ effect of the stylus in the groove, causing a momentary slowing of the record which is enough to deaden the impact of a drum hit or the attack of a piano note. DJ slipmats do not tick any of these boxes, they are only good for allowing the platter to turn at full speed while you are cueing the record with your hand. There are literally hundreds of aftermarket platter mats on the market made from all sorts of materials accompanied by outlandish claims made by the manufacturer. I have always found the cork and rubber mix ones to be very effective and pleasingly cheap. That makes them the second cheapest upgrade on this list. That’s about all for now. Happy upgrading!